The story I heard was that the show organisers approached Rob with the aim of hiring the dome. When asked what they intended doing with it they had only planned as far as putting on the Hank Wangford Country Roadshow. Rob and Keith persuaded them to give them money and responsibility for sorting out its use. So it came about that a mini fair was created in the midst of the traditional activities of the long running Eye Country Show. Was this the first fair Palfi came to? I seem to remember that Lee, who later joined Incubus, was his assistant. 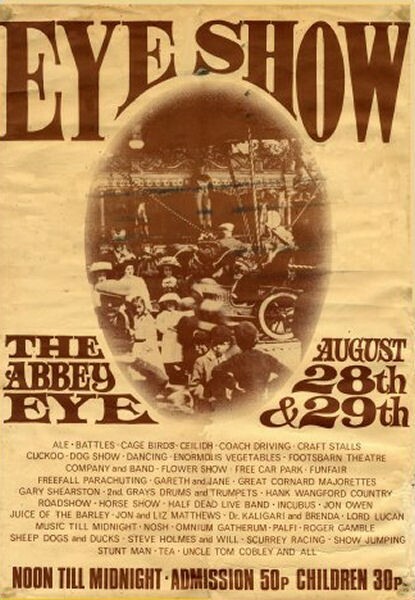 It was one of the few times that Footsbarn Theatre appeared at a fair.